The congress vice president, Rahul Gandhi, targeted the Modi government in parliament on the issue of black money on Wednesday. Rahul Gandhi said that I had heard 20 minutes speech of Kanhaiya kumar president of JNUSU and found nothing wrong. If someone did something wrong, one must be punished. Targeting on 'Make in India' project Rahul said that ‘Babbar Sher’ (lion) has been ready. Watch on TV; there is lion; wherever looked: the lion are sitting. How many people you gave employment. So the issue of Karti Chidambaram son of former finance minister P.Chidambaram was dominated, as the session started in Rajya Sabha. The House was adjourned first 10 minutes; As the AIADMK members began shouting slogans demanding the action. The ruckus was continued after resuming the House. It was again adjourned till 12 noon. 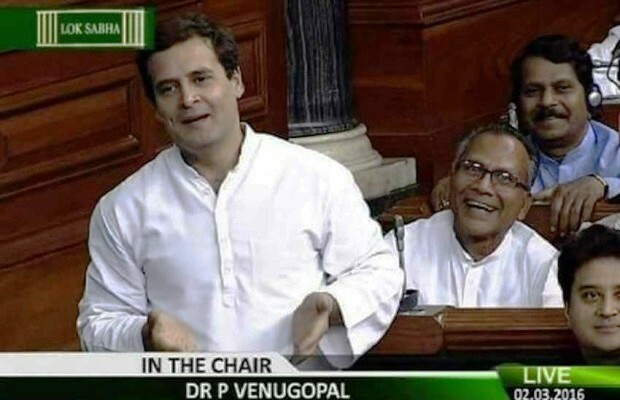 When the session resumed, on the issue of Chidambaram the uproar started again. The House postponed again till 2 pm afternoon. Rajya Sabha started again afternoon. The BJP MP Om Birla, gave notice in Parliament and demanded to debate on the issue of Karti Chidambaram, the parliamentary affairs minister,Venkaiah Naidu, has asked the explanation from the former prime minister and the home minister on the allegation in changing affidavits of Ishrat Jahan case. The BJP MP, Bhupendra Yadav has served ‘Calling Attention Notice’ in Rajya Sabha raising the matter of Ishrat Jahan. The congress is planning to tackle the BJP on the issue of Ishrat Jahan. The congress will pose the issue of RVS Mani, who had said that the Vajpayee government hatched the plan to attack on Parliament. Rahul said, “Modi government can neither repress the voice of the poor; will nor able to do untoward for the JNU." Rahul asked with the BJP on being ruckus, “Have the BJP given up Savarkar? Is the BJP not following his thoughts? ?” Rahul said the Modi government is not able to do for the country; only doing for the guidelines of RSS. When the professors, the students and the journalists were attacked, why were you tight-lipped? Do your thoughts teach you this? Why didn't you like to hear the statements and thoughts of others? The ruckus was incessantly in parliament for the allegations of corruption on Karti Chidambaram son of former finance minister P.Chidambaram and in the case of Ishrat Jahan on Wednesday.